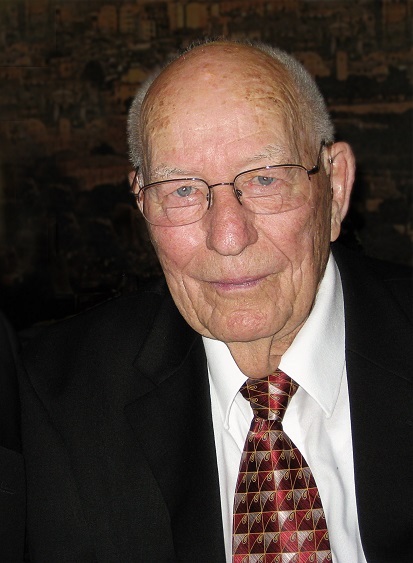 Leo Ersell Fredrickson, 95, of Boise Idaho, passed away Saturday, December 24, 2016 at home. He was born July 17, 1921, in Salina, Utah to Andrew and Othilia (Nielsen) Fredrickson. Leo was the youngest of 7 children. As a young man, Leo enrolled in the Coast Guard and was a veteran of World War II, serving his country from 1942-1945. He married Barbara Lazenby on May 16, 1945 in the Manti Utah Temple of the LDS Church. They are the parents of five children with a posterity of over 100, which includes children, grandchildren and great-grandchildren and their spouses. Leo’s worked with the Bureau of Indian Affairs at the Intermountain Indian School in Brigham City, Utah, Chemawa Indian School in Salem, Oregon, and retired in 1981 from working with the Umatilla, Cayuse and Walla Walla Indian Tribes on the Umatilla Reservation. While living in Pendleton from 1974 to 1999, Leo and Barbara served three full-time LDS missions together: An education mission in Tarawa-Guam, a member leadership support in Jackson Mississippi, and Denver Colorado Temple Mission. Leo and Barbara served in the Seattle and Portland Temples in between their mission service, and after moving to Boise in 1999 they also served several years in the Boise Idaho Temple. Leo always enjoyed spending time in the outdoors. He especially enjoyed hunting, fishing, camping, backpacking and golfing. He loved maintaining his yard and garden. Leo could usually be found with a cat somewhere close by, including his final days. He is preceded in death by his son, Richard and his grandson, Alex. He is survived by his wife Barbara and his children Bobbi St. John (Lamar) of Boise, Idaho; Larry (Hope) of Orlando, Florida; David (Karen) of Salem, Oregon; Scott (Lauri) of La Center, Washington, as well as Richard’s spouse, Teresa Fredrick-son of Boise and numerous grand and great-grandchildren. Visitation will start at 10:00 am and the services will be held at 11:00 am on Friday, December 30th , at the LDS Chapel located at 3200 Cassia. Boise, Id. Internment to follow at the Veteran’s Cemetery.